A letter from a former student of Mr. Tork – A.K.E.A. Mr. Tork, I was a student of yours a few years back at Auburn. I just want to say thank you for what you taught me, because it saved me from getting into a fight today. I live in Seattle, I was walking towards Broadway & Pine and this transient standing at the corner immediately made eye contact with me, glared, made a fist with his hands and starting walking towards me. I felt threatened. I put a hand up and told the guy to “back up and let’s not do this”, he just put on a meaner face, starting mumbling crazy talk to himself (he seemed mentally unstable) and kept coming towards me. At that point I remembered what you taught me in de-escalating. I had both my hands up, open palm so people could see I was not the aggressor and at the same time be ready to defend myself. I started shouting “No” “Stop” “Call 911”. I had to walk backwards for maybe a minute with my arms out and shouting. But someone from across the street yelled out that they called 911. At that point because of making a scene and someone calling the police, this guy saw this I was starting to be too much trouble and he walked away. I just want to say thank you. 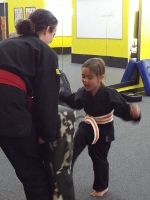 I’ve had several martial art instructors over the years. All of them have taught me self –defenses and discipline. But you were the one who taught me how to try and de-escalate the situation; to avoid the fight from happening. That training helped me get out of a bad situation today without any harm done. ← Previous Previous post: CALENDAR MAINTENANCE ALERT! 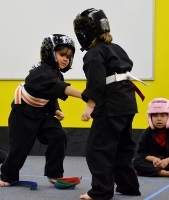 Next → Next post: AKEA voted #1 Martial Arts school in Auburn!